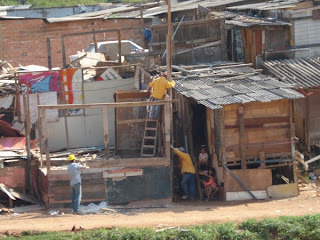 Read my article on inequality, Brazilian slums and The Spirit Level in World Architecture News. The article was inspired by a photograph of Paraisópolis favela by young Brazilian photographer Tuca Vieira and the recent debate around The Spirit Level, the book that argues that inequality is the cause of all social problems. The WAN editorial explains the context of the article. The picture below is not Tuca Vieira's, but another photograph of Paraisópolis.